Sometimes you find pockets of natural spaces where you’d least expect them. This week’s image was made in one such little gem, located in far northern Illinois. The landscape has changed over the years in this area, with Chicago’s suburban sprawl extending greatly and encroaching on what was once mile after mile of farmland. Still, whether corn fields, wheat fields, or subdivisions, one thing you wouldn’t think you’d find here is more than 3,400 acres of preserved natural land in the midst of it all. 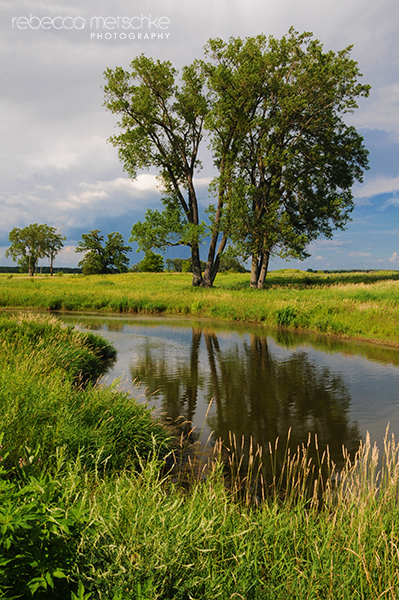 Glacial Park is a wonderful mix of prairie, delta kames, oak savannah, and wetlands. Nippersink Creek, ambling lazily through the park, is the cherry on top. 400 acres of it has been set aside as a nature preserve; this is one of the region’s top spots to view migratory wetland birds. I grew up about 45 minutes from what is now Glacial Park. Since the land was acquired after I moved away from Chicago, I had no idea this preserve existed and found it rather unexpectedly. In advance of a trip home to visit family, I was researching potential landscape photography locations in northern Illinois and stumbled across it. Ironically, it was only about 15 minutes from where my sister was living at the time. Though I ended up visiting on a number of occasions over a few years, nothing came close to the fantastic shooting opportunities I enjoyed the first summer I was there. Over the course of that week, I ended up working in the park over four sessions. One early evening, a line of thunderstorms approached and served up some beautifully ominous skies at it moved in. On another hot and humid afternoon during which time the air remained unusually clear, tremendous cumulus cloud production nicely complemented the deep blue of the sky and lush greens of the grasses and tree lines. And on the day the image pictured here was made – another steamy July late-afternoon – approaching storms created an interesting split-sky effect which was a nice backdrop for the tree and its reflection. This photo was incorporated into one of our personalized keepsakes for fathers. 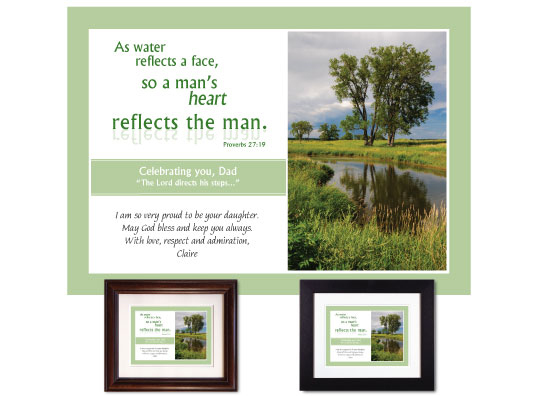 In looking for Scripture verses to use in conjunction with designs intended for dads, I thought this one from the Book of Proverbs worked well: As water reflects a face, so a man’s heart reflects the man. It certainly would have been appropriate for my own dad! Get the back story behind another one of our images next Saturday!